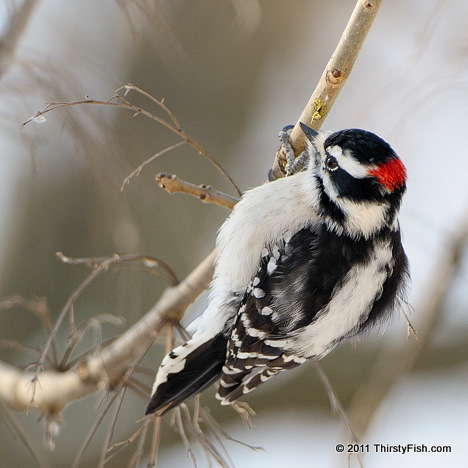 The Downy Woodpecker is the most common and smallest Woodpecker in North America. It prefers to eats insects but also feeds on seeds and berries. The males have a red patch on the back of the head lacking in the females. Many of the bird identification links on this site point to the Cornell Lab of Ornithology - All About Birds website. Established in 1915, the Cornell Lab of Ornithology is a leading research, study and education organization on birds. Between 2004 and 2006 another woodpecker made headlines throughout the world. There were a number of sightings reported of the Ivory-billed Woodpecker believed to be extinct since the mid 20th Century. The sightings were not supported with clear photographic, video, specimen or DNA (feces) evidence and the bird has remained evasive despite numerous efforts to relocate it. The Cornell Lab of Ornithology has a whole website dedicated to Ivory-billed Woodpecker. There is currently a $50,000 reward for offering substantive evidence that leads biologists to an Ivory-billed Woodpecker site.